The beam of negative charges proceeding rightwards, as shown in the figure, is equivalent to a beam of positive charges proceeding leftwards. 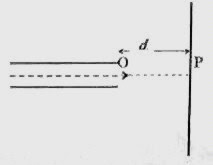 The magnetic force acting on the particles is downwards (as given by Fleming’s left hand rule). The charged particles exert an equal and opposite force (reaction) on the magnet. Therefore, there is an upward force on the magnet. The electronic balance therefore shows a reading less than R.